The hotly contested midterm elections are less than a week away, and right now when you turn on your local broadcast channel, you’re likely inundated by a load of political ads. 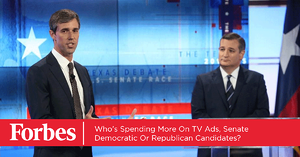 Candidates for Senate know one of the best ways to reach potential voters is during a local newscast or the commercial breaks for their favorite primetime shows. In an election where Democrats are trying to wrest control of the chamber from Republicans, one natural question is which party is spending more money on these ads? A new study finds that Democrats have pulled ahead in spending in the “tossup” races, ones considered possible wins for either side. Matrix Solutions’ 2018 Midterms Political Ad Spend Map analyzed spending in the top 10 closest Senate races across the country, based on data from 166 political advertising accounts facilitated by Matrix’s global ad sales platform. The data tracks general election ads placed through late October.